I am tempted to call this story Days of Heaven because growing up in Iowa in the 50s was pretty wonderful. Our dads went to work and came back home for lunch and went out in the evening to work on our cars or in the garden . Our moms kept house and had long phone conversations with the other mothers and were there for us when we wanted. When we weren’t in school (for that’s another story) we spent all our time outdoors. Oh, there were the early morning Saturday cartoons when we were older and finally got a television. Cartoons started at 7 am and ended after breakfast and then it was up and out if the weather was halfway decent which it usually was and even if it wasn’t we just bundled up and went anyway. The only time we were indoors was if there was a thunderstorm and a tornado warning or coming in 50 miles an hour sideways in a blizzard. Sometime we had a blizzard and when it stopped we would pile in the car and go sledding at the Country Club golf course. 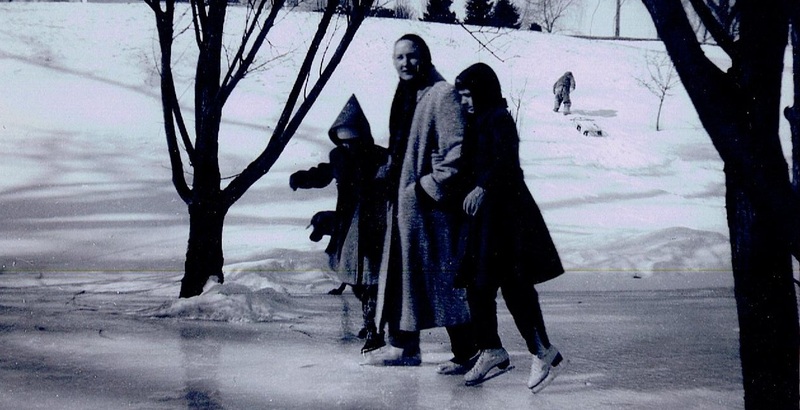 We had sleds and inner tubes and sometimes one family would bring a toboggan. The snow in Iowa was perfect for sledding. The first time I went skiing at Lake Tahoe I thought “let’s go sledding” because I was used to Iowa conditions. That thought was promptly squashed when we realized that the Sierra snow was too deep and all you did was sink. Not going anywhere on a sled, you weren’t! But in Iowa it was gravy. I mean it was perfect snow. Only about 3 or 4 inches deep and, boy, you could go fast! We kids would be airborne most of the time on those long slopes. A little bump and whoo-wee up you’d go sled or inner tube and all if you were holding on. If you weren’t you were ejected and flying on your own. I wish I had a photograph of the entire scene. It would have looked like a Courier and Ives postcard. Our Weimaraner dog Heidi (in silhouette), my sister, my mom and me. From our house on Fifteenth Avenue you went down Nevada Street to there was a little grocery store called Twin Foods. They sold milk and bread and a few other things. They had a real bakery in the back where they made the most scrumptious white sandwich bread, crusty crust and soft, chewy insides. In the winter the owner had the brilliant idea to take his tractor and scoop out a shallow depression that he then filled with water to freeze and make a kind of ice skating rink. Then with our classic white figure skates we girls would tentatively swoosh around. The boys would swoosh around on hockey skates because no self-respecting boy would be caught dead in figure skates. Sometimes we would go over to the bottom land on North Center Street where water went over the bank of the Iowa River, gathered in large tracts and then froze. We would skate there, too, but it was not very smooth ice so I never got very good at skating. I mostly got good at not falling. My dad holding the buck. Howard Stegman holding proof of the recurve bow. They fletched their own arrows, too. 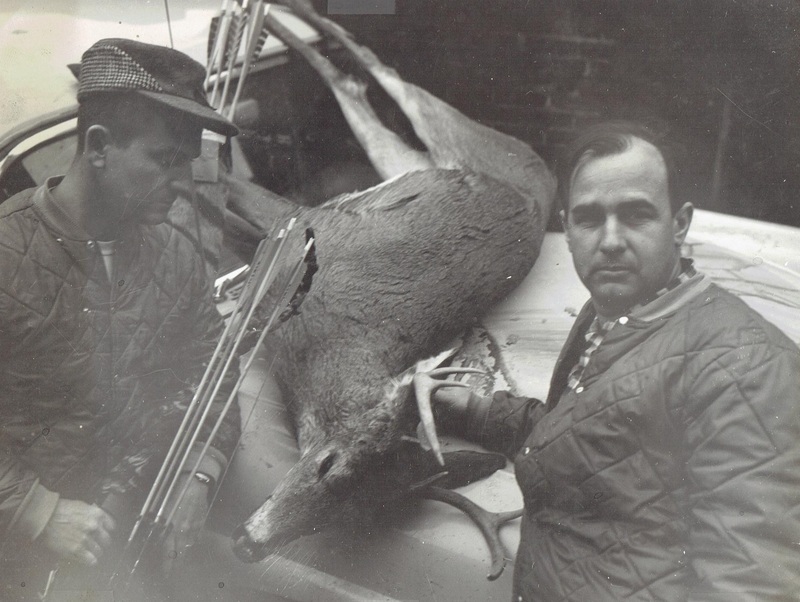 My dad was a hunter. He hunted all manner of wild animals. He hunted squirrels, pheasant, ducks, and rabbits. He even went to Canada once and bagged a moose. We were eating moose for a year. But deer were the most prized animals. He and his friends hunted deer with the classic recurve bow. Compound bows did not exist at that time. Al Polley was a farmer out north of town and he had corn fields and timber that bordered the north side of the Iowa River. He gave my dad and his friends permission to hunt there. To keep warm while they were hunting my dad and his friends built a plywood one room shack that they called the deer shack. Like I said they used it to warm up in. They needed this because how you hunted deer with a recurve bow was to make a little platform high up in a tree next to a trail that the deer used habitually. The hunters would sit for hours in the tree waiting for the deer to come along. But the deer didn’t come like clockwork so when our dads got cold they would climb down and get in the deer shack to warm up. Some snowy winter evenings we would take a big pot of chili out there and build a big fire and then stand around the fire and eat the chili with crackers. Later on I would go with my dad in the dark to scout for deer sign while the others stayed behind. I guess it had to be in the dark so as not to spook the deer so much. Dad never explained much of anything. But it made me fearless of the dark. Other winter evenings we would go out in the car just after dark and drive into the corn field stubble and circle the car around so the headlights would illuminate the perimeter of the field. If we were lucky we would see a deer herd feeding on the corn stubble. Their heads would pop up and we’d see their shiny eyes. Such beauty. My dad hardly ever hit a deer with his bow and arrow. I think maybe he hit one or two in all the years I was growing up. It’s hard to hold a recurve long enough to get the perfect shot and the deer would not come into the perfect position. Tree branches could be in the way. The dads practiced all summer at the Isaac Walton League so they would be as ready as they would ever be when deer season came. He doesn’t understand why blacks are all upset. He doesn’t understand why women are all upset. This is because he’s a fair-minded individual who’s never been prejudiced against any person or group. He looks on misbehavior the same way for everybody. If you do wrong you should face the consequences. He also believes that if a person has a problem they should work at it until they fix it. I think some of the fringe white men from Timothy McVeigh on up are doing whatever they can to feel like they still have power. Until we address this it’s my opinion we’re going to keep having this sort of gun, bomb, fill-in-the-blank violence. How to fix it? 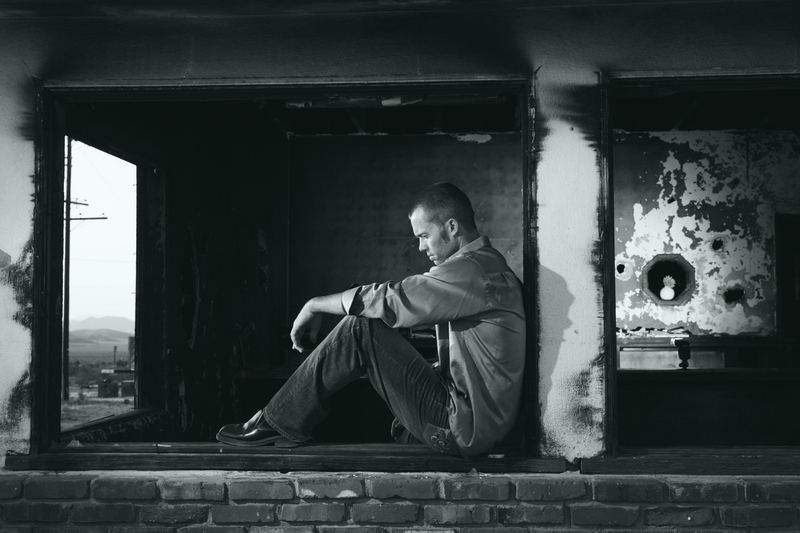 It’s my personal opinion that the men who are starting to feel disenfranchised need to have a come-to-Jesus meeting (not literally) and realize that there are ways to share power. The men who “get this” need to help their brothers. The Ranch Man is a peculiar kind of human. They are what might have been known in earlier times as the “rugged individualist”. I have a Ranch Man so I know what I’m talking about. I have done a casual study on the Ranch Man. Here are my findings. A Ranch Man doesn’t cotton to what they perceive in others as dishonesty, arrogance, pomposity, know-it-all and other self centered behavior. It does not matter to them that sometimes this means that they are guilty of this very behavior themselves. Their sense of right and wrong is keen and is written in a book of which they are the author. When the Ranch Wife encounters this in her Ranch Man it is best that she take a deep breath and hold her tongue. There is nothing you can do to change him, girls. This is the way he is and this is what you love about him. Keep repeating this mantra! He is single minded. He knows how to do things and he is sure of himself. This is a very endearing quality. However, it becomes less endearing when he directs this behavior toward you. This is where patience comes in very handy and if it gets too much for you to bear then knowing how to put your foot down without making him mad is useful. Ranch Man will always be fair if you are fair. Remember, Ranch Man is good at training colts. He is patience and kind but if the colt misbehaves he will make it very difficult for the colt to misbehave. He will make it easy for the colt to behave the right way thus making it seem to the colt that it is the colt’s idea to behave correctly. Girls, we need to take a cue from this very successful training system. You can use it on Ranch Man. Before I proceed I must warn you to never let on to him that you are doing this. Never, ever tell him, oh, you are just like a stud horse or that kids can be trained using horse training methods. He will not take kindly to the comparison. He thinks he is superior to livestock. You know and I know he is not superior but we can’t let on that we know this truth. We must keep him in the dark about this reality if we are to keep him happy. This does not mean we look down on the Ranch Man. To the contrary, we have a deep respect and love for Ranch Man just like we have deep respect for the livestock with whom we partner and depend on. For example, the horse can bolt and kill you. It is obvious that it is unwise to disrespect the livestock and it is necessary for survival to know and understand the critter that you are dealing with. Ranch Man is not any different. Ranch Man can use the English language and the livestock cannot. This is the only difference. However, this breaks down if you have to go out in the field with Ranch Man and he starts using his hand signals on you from afar. Then you know he is speaking another language and it is not a language from the planet you live on. It is best you learn this language. Other Ranch Men understand this language. You can learn it, too. Unfortunately, the only way you can learn it is through trial and error. Ranch Man does not know how to teach it. He learned it through trial and error himself. Just keep breathing. It will come. Finally, living in harmony with Ranch Man is not for ignorant, stupid girls. This is why the most successful Ranch Wives are of superior intelligence. If you meet a successful Ranch Wife you will be immediately struck by her calm demeanor, knowledge of life and how to get things done. The average Ranch Wife will dominate over the average City Wife at any level. This is just a fact of life. I’m all about giving credit where credit is due. Let’s hear it for Ranch Man and Ranch Wife! Tile On, Ye Kings of New England! And so it came to be that we decided we would lay the tile floor ourselves. We had no money to hire it done. Anyway, we wouldn’t learn anything that way, would we? By golly, we could do it! We are cut from the do-it-yourself cloth. So when we decided to tile the bathrooms and the kitchens we took classes at Home Depot and watched videos to prepare ourselves. When we felt sufficiently prepared we went out, bought the tile and supplies and started in. Now we’re almost done with the “practice” bathroom. We just have the grouting to do. We are taking a break. It has been, shall we say, a learning experience. I found that I could do 5 or 6 tiles every 3 days and then I got sick so I could do even less. Tile. Let it dry. Get distracted by some other project. Start in again. Marty could not lay tile. He gets the thin set all over the place and becomes frustrated. I, on the other hand, have patience and confidence. Probably unjustified confidence. I just believe I can do it and actually have no investment in it if I fail. My cake baking experience has shown me how to spread frosting on a cake. Thin set is not unlike frosting for consistency. So, me. I get to lay all the tile except the two Marty did. What Marty does is power tools. I hate power tools. They frighten me. So he uses the tile saw and cuts tiles. He also mixes the thin set. Teamwork. He gets to use the table and sit down in a chair while he does his job. I get to hunker down on the floor and get a good old-fashioned charley horse. Hmmm, let’s see. It’s keeping me young, right? Use it or lose it. At least that’s what I keep telling myself. Put long gray hair on this guy, get him to lose a few pounds and it’s…me! Thankfully it’s only a 50 square foot floor. It will take us 3 weeks to completely finish. That’s not so bad. We have another bathroom so we’re fine. Getting the odd-shaped tiles that go back behind where the toilet was is the hardest. And why do the toilet connections always have to leak? There I am trying to contort myself around the bowl that’s catching the slow drip. I’m also enjoying (not) being near the toilet connection in the floor and lovely stench of the septic tank wafts up through the hole. What crazy maniac set this tile? Here I feel compelled to say this to the professional tile setter: We are not worthy! You, O Amazing One, have the mystery! In the doing of it I find that the Home Depot classes definitely don’t tell you everything. They trot out the premixed thin set so you don’t get to learn how to mix thin set correctly and dependably. They lay a cement board for a practice surface on a table, give you a few small rubber backed tiles and a spatula and say “want to try it?”. They don’t tell you anything about over or under mixing thin set, letting thin set harden around your newly laid tile (don’t) and, of course, it’s all done standing up at a table. Where in the world will anyone lay floor tile while standing at a table? They should conduct the class on the floor! Then you get the correct idea. Bring in the knee pads? Wash your ibuprofen down with a fine single malt scotch! Now we’re cooking with gas as me dear old farver would say! It’s back-breaking work, folks. There you are, down on the floor, bending over, slapping thin set all over the place, spreading it, combing it and hefting heavy tiles into place and, lord forbid, if you make a mistake you’re prying said heavy tile off the floor and the thin set won’t let go. Dadgummit! Let go! Of course, as with anything the more we do it the better we will get. By the time we finish the kitchen we’re going to be experts. This is not the house we bought in 2016. But it might as well have been. We bought a great property in 2016. It was just what we wanted or pretty damn close. It was in an OK neighborhood, with all the features we wanted (horse infrastructure) and at the right price. It was a dump. It had not been taken care of but it was solid in its bones and all we had to do was fix it and update it. So that’s what we’re doing. First thing we did was have the roof and windows replaced. The roof was as old as the house. Thirty one years old. It was shake shingle and it looked like it should be leaking like a sieve but fortunately it wasn’t. The windows were also as old as the house and had obnoxious dark screens on them. Maybe to keep out the summer heat? Who knows? All they did was keep the light out. The interior of the house was very dark and cave-like and it didn’t help that the walls were painted a “sophisticated” dark taupe. Which we subsequently covered up with a nice creamy white. Creamy white = good palette for everything else. Fixing the roof and windows made a huge difference. We bought windows are highly efficient, insulating and triple pane and the roof is what’s known as a reflective “cool” roof. While the roof was being replaced we had extra insulation added in the attic. This has made it a lot easier to heat and cool the house. It gets pretty hot here in the summer so that’s mandatory. It doesn’t get very cold here in the winter but it’s nice to be able to heat the house with our wood stove. So we do and it is nice. We have low utility bills. And wood is plentiful here. We just go down to a local orchard and get seasoned almond wood for cheap. Like $74 a half cord. Here’s another thing we did. We traded the old, inefficient, non-EPA certified wood stove replaced for a new one free from a San Joaquin Valley air quality program. With all the bells and whistles. Ok No bells and whistles but Canadian and pretty darn good. While all that was in process we removed the popcorn from the ceiling in Marty’s office as a test. Did I mention I hate popcorn ceilings? I think it’s like living in a scrubby pad. Yah, popcorn is easy for the builder by cracky. Making a smooth plaster wall is not for the faint of heart, I tell you. We tried it. Hard, I tell you. Impossible as a matter of fact. I had seen it done years ago. I had even done a bit of it years ago but I guess I had not done enough to really know. Getting the popcorn off was easy although unbelievably messy. First, we had it tested just to absolutely make sure there was no asbestos in it. Before 1977 they might have made it with asbestos. Ours had no asbestos. If there was asbestos in it the only thing we could have done was to have it removed by specialists for about a million dollars or leave it alone and or cover it up. By the way, did I say removing popcorn is easy? Lay down a tarp over everything! Squirt the ceiling with water. Wait a bit. Scrape it off. Drag the heavy tarp full of popcorn out to the trash. And did I tell you I love smooth plaster walls? I believe I did. Since I thought I knew what I was doing we tried to do it ourselves. We bought everything and started. We quickly became over whelmed. We did the whole room and stepped back and pronounced it bad. Bad to the bone. So we hired a professional to fix it. The professional plasterer showed us how making a smooth plaster wall takes forever. You have to get the surface immaculate. Then you do your first skim coat. Then you let it dry. Then you sand. Then you plaster. Then you sand. Then you plaster. Then you sand (how many times can I type that?) And then in 2 years your drywall nail holes start to show because of settlement and earthquakes and what not. The plasterer talked us out of smooth walls. Boo Hoo! He talked us into knock down texture on the ceiling and walls. Boo Hoo! It cost a lot for him to do that. What an education! Now I have to live with popcorn ceilings throughout the whole house. Boo Hoo! This is why flippers have an advantage. Have you seen a show? They GUT a house, I tell you. Now I know why. If you take everything down to the studs you can fix the plumbing. You can rewire. You can start with new sheet rock and plaster the right way. You can rearrange the kitchen. You can take out a wall. Etcetera, etcetera, etcetera. If you don’t do what the flippers do you are at a huge disadvantage. The house dictates what you can or cannot do. The house is the boss. Now we are tiling the bathroom floor. We bought everything and then when laying the tiles out we find that the floor is not flat. Whaaaat? Another thing about flipper TV shows. They make it look so easy and fun! When you watch the flippers and you haven’t paid close enough attention or you don’t have experience I will tell you they leave a lot out. They leave out things like this: to tile you must have a completely FLAT floor. We find out that in an ordinary house the slab will not be flat. Like who cares when they first built it? Slaving over getting it flat is time-consuming and expensive. So guess what the original builder does? He covers the floor with vinyl and carpet. Close enough for government work! Tile will teeter totter on a floor that is not completely flat and will eventually break. Now we have to remove the linoleum and do a bunch of stuff first. No getting right to the excitement of laying tile. Let me tell you removing linoleum is hard! It’s stuck down good and here we find 2 layers of yucky old linoleum. But we are game. We are going to do it. The house will not win this one. So we have to buy primer. We have to buy leveler. And then we get to tile the floor. This is what you find out when you have an older house that has not been updated. This is what it is. Tracy Kidder wrote a book called “House” about the building of his dream house. There also is a movie called “The Money Pit” but, of course, that was Hollywood and not realistic. Just start remodeling your own house and you will be able to write a story of your own. It’s guaranteed. My sister sent this to me today. I thought it was a nice thing to read on the first day of January of the new year 2018. Twenty eighteen! I can’t believe it’s already eighteen years past the millennium! So here’s this thought for all of you. My wonderful friends near and far. We’ve heard stuff like this before but it never hurts to hear it again. My sister says she thinks this was said by Steve Jobs. If it wasn’t said by him they are still good words. eyes, my life is an epitome of success. only a fact of life that I am accustomed to. in, have paled and become meaningless in the face of impending death. found when it is lost – health and life itself. the day when the curtain comes down. Whether we carry a $300 or $15 wallet or handbag – the amount of money inside is the same. Whether we drink a bottle of $300 or $2 wine – the hangover is the same. material things of this world. Whether you fly first or economy class, if the plane goes down – you go down with it. & earth, that is true happiness!! 1. Don’t educate your children to be rich. Educate them to be HAPPY. 2. Eat your food as your medicines. Otherwise you have to eat medicine as your food. if there are 100 reasons to give up he or she will find one reason to hold on. 5. You are loved when you are born. You will be loved when you die. In between, you’re the one who has to manage! I love the end of the year in a way. I’m sad for the passing of the old year but I can’t do anything about that. I mean, I can’t slow it down. So. Just like the rest of humanity I have to accept it. Or not. I choose to accept it. And do what I can with it. The end of the year gives me time to reflect on where I’ve been and where I want to go. So I did that. And what I’ve decided is this: I want to go in a direction my mama probably would not advise me to go. But my mama is not here and I’m all by my lonesome (funny how adulthood gives us all this freedom and then we decide not to exercise it!) I’m just going to go where I want – damn the torpedoes full speed ahead! In hind sight I gave a year away doing what I was not really suited for (real estate) but that’s all right. I had to try. Trying is what life is all about. If those people out there who have the opinion that I’m not doing it right, well, they can just shut their pie hole because it’s my life, don’t you forget! I have big plans and I can hardly wait to start publishing. Like “they” say: Today is the first day of the rest of your life!